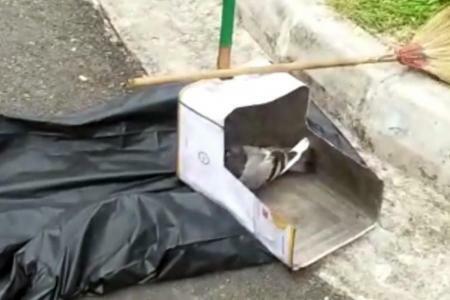 The recent case of a pigeon culling video at Aljunied Hougang Town council, which ACRES described as “an outright case of cruelty” – is the common practice used by pest control companies engaged by all Town Councils in S’pore. Culling is normally done regularly every 3 months. AVS (formally AVA) is well aware of the method employed as they are the one who approved this inhumane and cruel method of culling pigeons. SPCA is aware of it too but they believe AVS is working towards a more humane way of culling. Unfortunately – their ‘belief’ never materialised as AVS sticks to this low cost quick fixes which they claimed is ‘effective’. I thought ACRES is aware too – after all this bad practice has being going on for more than a decade with little result in controlling the pigeon population. This itself is evident that the method is NOT effective. We understand the need to control the pigeon population in housing estate, but a more humane method should be used. It is very cruel to have them suffered so much pain first by poisoning then suffocation while being culled. Those pigeons that did not ingest sufficient poison food, flew off and we often see dead birds the next two days at various blocks. If the cleaners do not spot them, the carcass will pose a hygiene problem. AVS has tested out contraceptive method to reduce pigeon population at a mosque and a temple as I recalled for around 3 to 5 years. However AVS seems hesitant to implement is as it is more costly. This method has been found to be effective in other countries. Sterilization of stray cats has been very effective, thus contraceptive method on pigeons would likely see fruitful results, which years of ruthless poison plus suffocation culling has not. against animals. It also goes against our national kindness movement and compassion teaching of religions. « An ‘Exercise of Government Power,’ but can we trust them to use it appropriately? You should stand up against the cruelty against our citizens by foreigners. 1) The cyclist who was let off with just a fine after being the aggressor who broke the poor uncle’s side mirror. 2) The white trash who attack the security supervisor unprovoked. I’ll like to see what he will be handed. 3) There are many more cases of cruelty against our old and helpless citizens. Pigeons are pests who steal food, just like the many intruders who stole our lunches. If any animal poisoned to death by any ordinary sg,ACRES n others will make LOUD LOUD NOISE. BUT,when OFFICIALLY DONE,it is now not cruel??? In SIN City,DOUBLE STANDARDS is the name of the game. More cruel is to see elderly sgs taking their own lives to alleviate financial burfen for their children??? So do RICH GAHMEN CARE AT ALL? Ya,splashing on nonsense like F1(and justifying it) n squandering on FT-$cholarships,building glitzy iconic *jewels*,etc n paying oneself top of the world salary while finding all sorts of reasons NOT TO GIVE MORE DECENT SOCIAL ASSISRANCE TO OUR JOBLESS,POOR N NEEDY IS INDEED CRUELTY OF THE WORST KIND! WE NEED TO BE HUMANE FIRST TO HUMANS ESPECIALLY OUR OWN COUNTRYMEB,else how to be HONESTLY KIND TO ANIMALS? DO YOU SEE ANY MP TRULY SPEAKING OUT AGAINST GOVT’S CRUEL PRACTICES AGAINST HUMAN-BEINGS OF THIS COUNTRY? Acres denunciation of pigeon culling below is POLITICAL FARTING. SINCE WHEN ON EARTH did Acres talked publicly and ADVANCING LEGISLATIVELY about saving the lives of pigeons? Walking pigeon desiccated coconuts inside ACRES is just attention seeking that it is alive and noisy when convenient or opportunistic of vote baiting attention. JUST ASK THEM WHAT HAVE THEY DONE ABOUT STRAY CAT CULLING INFESTATION IN HOUSING ESTATE, they along with AVA, are more likely to be either silent or opposing on that one. STRAY CATS KILL PIGEONS. Acres & AVA know of this fact and DIAM DIAM DIAM. SO THERE YOU GO, another windy happy contradiction from ACRES. WHERE WERE ACRES when TCs used guns to shoot to kill (in kindness???) crows in HDB estates years prior? DO ACRES CULL PIGEONS in Nee Soon GRC and, if so, do it any differently….perhaps sealed with a loving goodbye RIP kiss? How to expect a dictatorship that don’ even have any manner of respect for it’s own fellow citizens as elected govt. As they consistently behave top down more as dictators/ VTO is the only solution to rid us from this mad malady. What do you think? Georgia Tong…Your examples that contraceptive methods can be used to cull pigeons and cats! Yes, cats I believe but birds….something like living in Peter Pan’s realm! Are you aware that Pigeons are carriers if the virus transmitting meningitis? Many parents and their children are ignorant and seem to enjoy feeding these birds without realizing the consequences! WHERE WAS LOUIS NG when Ah Lian hokkien-speak about cats and python in the political zoo? i dunno if some culling work was done around circuit rd this couple of days.. coming home today i saw 3 dead pigeons just short distances of each other near the hdb blk where i live…or mayb its due to the blazing heat? the residents are to blame at times…ive seen residents throwing bread or rice from their kitchen windows….tens of pigeons will gather immediately to fight for the scraps..